Topic: Why people hate this show nowadays? Topic: How did you first get into Evangelion? There is also to possibility of them trying to make Shinji belive he couldn't pilot anymore so he would not try, if somehow getting the chance to. Topic: First image of "New Unit 02"
^ I think you missed the 'too' there. 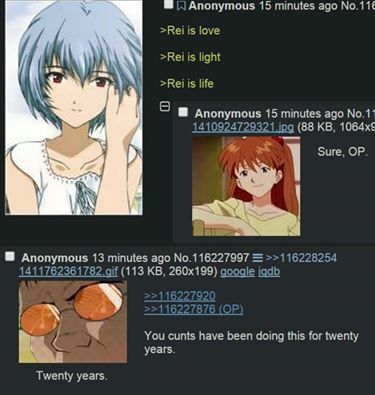 The idea beeing that Shinji and Asuka both go back in time. Topic: Did Asuka and Misato really hate Shinji in 3.0? Re: Did Asuka and Misato really hate Shinji in 3.0?